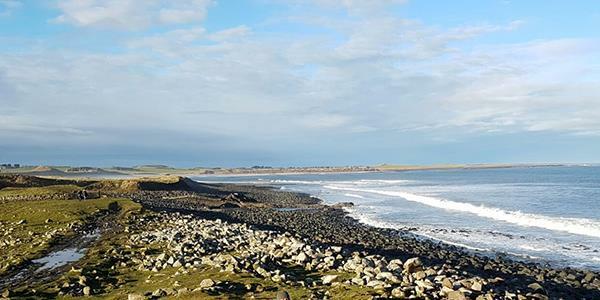 Northumberland's coastline is such a well-regarded stretch of the country that it has been designated an Area of Outstanding Natural Beauty. This remote, sometimes wild, landscape is characterised by huge white beaches, rugged cliff tops, quaint little fishing villages and colourful heath grasslands. But perhaps Northumberland's most distinguishing feature is its number of coastal fortifications. In a telling show of the county's long and fraught history, the dramatic Northumberland coastline is dotted with strongholds and castles. More, in fact, than any other county in England. From the 14th century Northumberland saw 300 years worth of warfare and raiding, clan disputes and clashes with the Scots. Northumberland had a strategically enviable position looking out over the North Sea and the huge castles and towers you see looming high above the beaches today, originally built for defence, now serve as picturesque backdrops to sweeping beaches. There are some truly fantastic beach-castle panoramas to be found; just between Warkworth and Lindisfarne there are five castles in 20 miles. 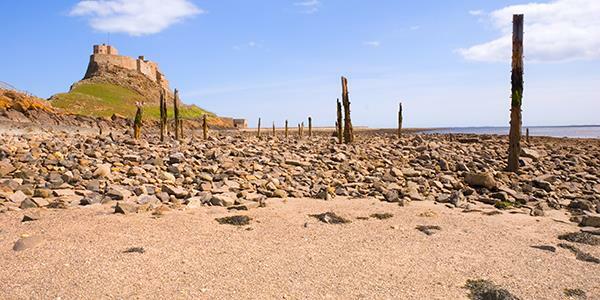 The Lindisfarne National Nature Reserve is a portion of the coastline that's protected for its wildfowl and wading birds. The reserve incorporates the tidal island of Lindisfarne, the causeway and dunes. These extensive dunes are packed full of wildlife. With a range of plant species (marram grass, orchids, pirri-pirri bur, forget-me-nots and various flowering plants) it is ideal habitat for moths, butterflies, insects and grazing animals. When the tide is out you'll find huge expanses of untouched soft white sand and incredible views across to the 16th century castle and 12th century priory. Bamburgh Castle Beach is slightly further south and a fantastic one for families. It's long and very sandy, with no pebbles and is backed by sandbanks. The castle sits up on the cliff behind you. Though the current structure dates from Norman times it underwent major restorations in the 18th century. 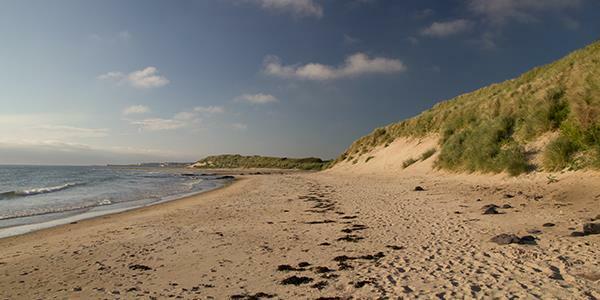 With such a diverse range of habitat, the Northumberland coastline is able to support an incredible selection of wildlife; both plants and animals. One thing it is famous for is its fantastic bird population. Being part of the eastern coast of England, Northumberland receives many migratory species passing through during the autumn. In the colder months many waders and wildfowl come from their northern breeding grounds to overwinter here. The sea cliffs and offshore islands such as Holy Island and the Farne Islands also make this patch of coastline ideal for breeding and nesting seabirds during the spring. Northumberland really is a birdwatcher's paradise! Coquet island is an RSPB bird sanctuary located a mile from Amble. It's a fantastic place for nesting seabirds and is home to a large colony of terns as well as several thousand puffins. 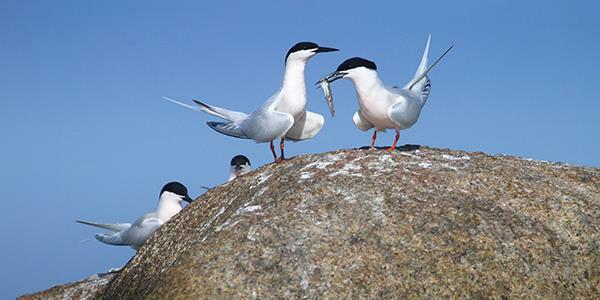 Sandwich, Arctic and common terns accompany the rare roseate terns, for which the island is a specially protected haven. It is thought that Coquet is home to 90% of the UK's roseate tern population and you can identify them by the subtle blush to their breast feathers in the summer. 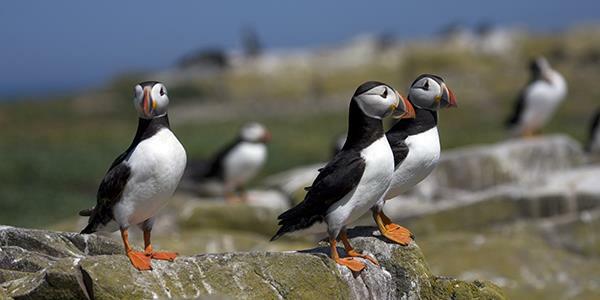 The puffins are first spotted offshore around March/April and come ashore for the nesting season, taking over the main part of the island until August. Because the island and its inhabitants are so protected, the public is not allowed to land, though a boat tour on one of the charter boats will provide excellent close-up views of the seabirds. These characterful animals can be spotted in Northumberland at all times of the year. Keep your eyes peeled for their little heads bobbing in the waves, or take a boat to one of the outlying islands. Seals will haul out on to rocky outcroppings so the Farne Islands are ideal, as is Coquet Island. From the autumn you will start to see the fluffy white pups up on the rocks with the adults. 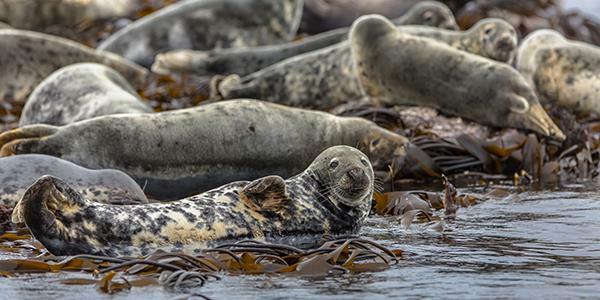 The Farne Islands' grey seals make up the third largest grey seal colony on the east coast, and their island is under the special care of the National Trust. 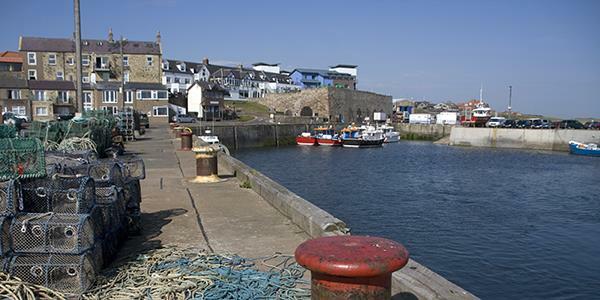 Boat trips to the Farnes can be made from the nearby fishing village of Seahouses. Find out more information on the National Trust website. If you don't fancy a boat trip you could try having a look for them along the rocks at Newton Haven, or even in the Lindisfarne Bay. Aside from the incredible wildlife, this stretch of coastline is stunning for walks. A range of terrain and constant spectacular views makes this area perfect for anyone who fancies a wander. The main walking route is the Northumberland Coast Path which is a long distance trail from Cresswell to Berwick-upon-Tweed. The route can be broken down into sections and you can pick it up at any point, so it can be catered to any level walker. The trail is waymarked in both directions and mostly follows public footpaths and bridleways. The majority of it is flat and even for walking, though it is still a good idea to wear walking shoes. You can learn more about the route on the website. You can find out more about Lucker Hall and how to stay in this stunning area of England for yourself. Simply enter your details at the bottom of the page to receive a free brochure.